Every time I make lasagna, I'm left with at least one cup of ricotta cheese leftover in the container, so it usually ends up in baked goods. 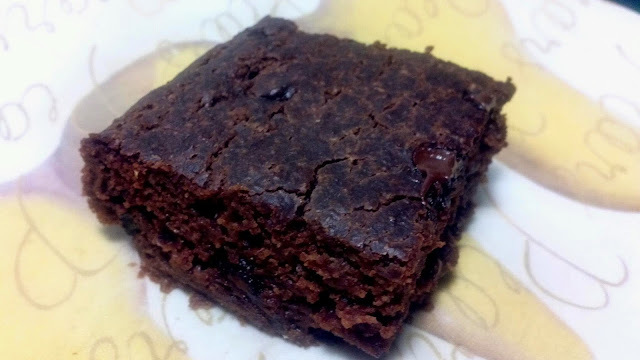 Last time, I made Pear & Honey Ricotta Bread, but this time, I wanted to try brownies. I'm a big fan of ricotta because it is high in protein and low in calories (as far as cheese goes! Preheat oven to 375 degrees F. Grease a 9x7 or 8x8 baking dish and set aside. In a large bowl, combine flour, cocoa, salt and baking powder and stir. Add ricotta, coconut oil, maple syrup, eggs and water. Stir wet and dry ingredients just until uniform. Fold in chocolate chips. Pour batter into baking dish and bake for 30 minutes, or until a toothpick comes out clean. Allow to cool before serving.